Thank you everyone who was able to come out to our Happy Hour on the “Solar in Your Community Challenge” this past Tuesday night! And a huge thank you to our speakers: Eric Coffman, Scott Nguyen, and Ramsey Cripe; who represented Waco Community Solar Farm, 1PlanetSol, and Kerrville Area Solar Partners, respectively. If you couldn’t attend, don’t worry about it. We have the presentation slides from Scott and Ramsey and are posting them here! If you have any questions, ideas, or follow up for us and/or the speakers or their organizations, please comment below or contact us. Kerrville Area Solar Partners Presentation. This month, Solar Austin will focus on efforts across Central Texas to make solar more accessible to low- and moderate- income families. Low- and moderate- income families represent 40% of America’s population, but less than 5% of all solar customers. 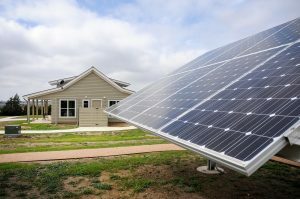 These households, non-profits, and government organizations face several barriers to going solar, including limited financing options, low or no credit history, and lack of access to the 30% Federal Investment Tax Credit. Ramsey Cripe, an ERCOT market and regulatory analyst, from the Kerrville Area Solar Partners team. Tuesday, October 24th, 5:30 – 8:00 p.m. The Waco Community Solar Farm will significantly reduce energy costs for 87 low and moderate income families living in affordable housing by partnering with Green Mountain Energy to take advantage of a “virtual net-metering” solution. 1PlanetSol is developing the 1AustinSol Community, leveraging consumer interest and buying power to support the installation of solar on the homes of low-income families in Austin—the 1AustinSol Community will soon reach 1000 members and 100 businesses to support 100 kW of solar to benefit low-income households. Kerrville Area Solar Partners will work with a solar developer, local non-profits and property owners to install a 999 kW solar project with 100% output dedicated to support a new, lower cost rate class for qualified low- to moderate-income families and non-profit customers. We hope you’ll join us on October 24th for this exciting conversation! This month, Solar Austin is going to step outside of our Austin bubble and hear about solar development in Africa. While industrialized countries face the challenge of transitioning from fossil fuels to renewable energy, many developing countries – particularly those in Africa – don’t even have widespread access to electricity. While 80% of the global population has some access to electricity, only 30% of people in Africa do. About 600 million Africans live without electricity, mostly in rural communities. Solar is helping communities in Africa leapfrog past polluting fossil fuels to expand access to this essential service. With access to electricity comes improvement in educational opportunities, health services, and access to clean water and information. Instead of relying on massive transmission line investments, the electrification of Africa is utilizing on-site solar and micro-grids, which allow development to proceed much quicker. This month, we will hear from Bako Ambianda, the Founder, Chairman, and CEO of Labacorp Group, and an international development specialist, business strategist, and global African entrepreneur. Mr. Ambianda will discuss his experiences facilitating off grid and large-scale solar projects in Africa including his involvement with Akon Lighting Africa. 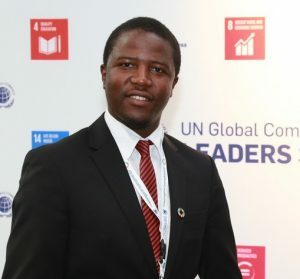 In 2012, he developed a game plan and “blue print” for tapping into Africa’s opportunities in key sectors, facilitating international solar, biomass, hydro, and hotel construction projects in 16 African countries, with clients from China, India, US, Turkey, France, and Germany. He will talk about the challenges, opportunities, and trends in developing solar in Africa. Tuesday, September 26th, 5:30 – 8:00 p.m. Solar Austin is excited to present Mr. Ambianda, as our September Happy Hour speaker, and we hope you’ll join us for this exciting conversation.